Former California state senator pleads guilty to felony racketeering charge. Former California state senator Leland Yee pleaded guilty Wednesday to a felony racketeering charge, admitting he solicited and accepted bribes, and will likely face prison time for his part in the high-profile organized crime and public corruption case that ended his political career. Yee previously pleaded not guilty to bribery, money laundering, gun trafficking and other felony charges, and was scheduled to go on trial later this month with three other defendants, political consultant Keith Jackson, his son, Brandon Jackson, and former sports agent Marlon Sullivan. But Yee changed his plea today in federal court, admitting to wire fraud and using his political influence to accept bribes, and will likely serve prison time of at least several years. According to federal sentencing guidelines, he could face a maximum of 20 years in prison and a $250,000 fine. 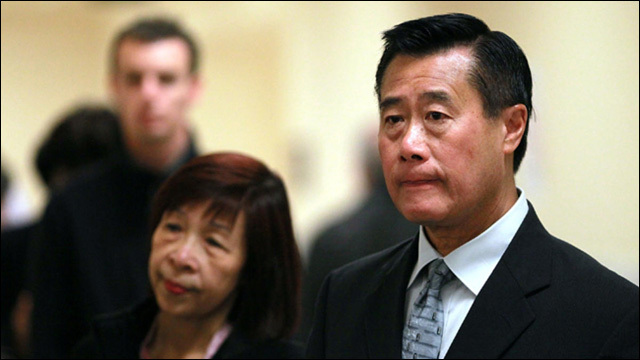 Former state Sen. Leland Yee pleaded guilty Wednesday to a charge of racketeering, admitting he accepted bribes from undercover FBI agents posing as campaign contributors. “I also agreed ... to conduct ... the affairs of the campaign through a pattern of racketeering activity,” Yee said in the agreement, which was filed in court. The FBI arrested Yee and 19 others last year during a series of raids through the Bay Area. Among many other shady dealings, Yee was accused of soliciting and accepting bribes from alleged Chinatown gang leader Raymond "Shrimp Boy" Chow in exchange for political favors. Yee also conspired with a guy who turned out to be an undercover FBI agent to import guns from the Philippines in exchange for campaign contributions. It's like something out of The Wire. Yee is scheduled to be sentenced on October 21. Enjoy prison, sir.